For other uses of "Strawberry tree", see Strawberry tree. ▲ Introduced and naturalized (synanthropic). Arbutus salicifolia (Lodd.) Cels ex Hoffmanns. Arbutus turbinata Pers. ex Rchb. Arbutus unedo was one of the many species described by Carl Linnaeus in Volume One of his landmark 1753 work Species Plantarum, giving it the name it still bears today. A study published in 2001 which analyzed ribosomal DNA from Arbutus and related genera found Arbutus to be paraphyletic, and A. unedo to be closely related to the other Mediterranean Basin species such as A. andrachne and A. canariensis and not to the western North American members of the genus. Arbutus unedo and A. andrachne hybridise naturally where their ranges overlap; the hybrid has been named Arbutus × andrachnoides (syn. A. × hybrida, or A. andrachne × unedo), inheriting traits of both parent species, though fruits are not usually borne freely, and as a hybrid is unlikely to breed true from seed. It is sold in California as Arbutus x Marina named for a district in San Francisco where it was hybridized. The leaves are dark green and glossy, 5–10 cm (2–4 in) long and 2–3 cm (1–1 in) broad, with a serrated margin. The hermaphrodite flowers are white (rarely pale pink), bell-shaped, 4–6 mm diameter, produced panicles of 10–30 together in autumn. They are pollinated by bees. The fruit is a red berry, 1–2 cm diameter, with a rough surface. It matures in about 12 months, in autumn, at the same time as the next flowering. It is edible; the fruit is sweet when reddish, and tastes similar to a fig. The name unedo is attributed to Pliny the Elder, who allegedly claimed that "unum tantum edo", meaning "I eat only one". It is not known whether he meant that the fruit was so good he could eat only one, or whether he meant that the fruit was uninteresting so he ate only one. Arbutus unedo is widespread in the Mediterranean region: in Portugal, Spain and southeastern France; southward in Algeria, Morocco, and Tunisia, and eastward in Italy, Slovenia, Croatia, Greece, Turkey, Cyprus, Lebanon, and Syria. It is also found in western France, Albania, Bulgaria and southwestern Ireland. Its disjunct distribution, with an isolated relict population in southwestern and northwestern Ireland, notably in Killarney and around Lough Gill in County Sligo, which is its most northerly stand in the world, is a remnant of former broader distribution during the milder climate of the Atlantic period, the warmest and moistest Blytt-Sernander period, when the climate was generally warmer than today. The red-flowered variant, named A. unedo rubra by William Aiton in 1785, was discovered growing wild in Ireland in 1835. Arbutus unedo serves as a bee plant for honey production, and the fruits are food for birds. The fruits are also used to make jams, beverages, and liqueurs (such as the Portuguese medronho, a type of strong brandy). Many regions of Albania prepare the traditional drink raki from the fruits of the plant (mare or kocimare in Albanian), hence comes the name of the drink "raki kocimareje". In order to reduce the high content of methanol in the drink, the spirit is distilled twice. Honey produced has a characteristic bitter taste. In folk medicine, the plant has been used for antiseptic, astringent, intoxicant, rheumatism, and tonic purposes. Arbutus unedo is cultivated as an ornamental plant by plant nurseries. 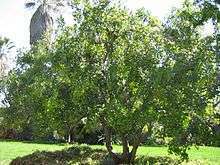 It is used as a single or multi-trunked ornamental tree, and as a specimen or hedge shrub in gardens and public landscapes. When grown as a tree rather than a shrub, basal sprouts are kept pruned off. The plant prefers well-drained soils, and low to moderate soil moisture. Unlike most of the Ericaceae, A. unedo grows well in basic (limy) pH soils. In cold climates it prefers a sheltered position due to its late flowering habit. Arbutus unedo is naturally adapted to dry summer climates. It is therefore useful for planting in regions with Mediterranean climates, and has become a very popular ornamental plant in California and the rest of the west coast of North America. It is hardy in USDA Hardiness Zones 8 to 10. It also grows well in the cool, wet summers of western Ireland and England, and temperate regions of Europe and Asia. Pests include scales and thrips, and diseases include anthracnose, Phytophthora, root rot, and rust. Its Mediterranean habitat, elegant details of leaf and habit and dramatic show of fruit with flowers made Arbutus unedo notable in Classical Antiquity, when Pliny thought it should not be planted where bees are kept, for the bitterness it imparts to honey. The first signs of its importation into northern European gardens was to 16th-century England from Ireland. In 1586 a correspondent in Ireland sent plants to the Elizabethan courtiers Lord Leicester and Sir Francis Walsingham. An earlier description by Rev. William Turner (The Names of Herbes, 1548) was probably based on hearsay. The Irish association of Arbutus in English gardens is reflected in the inventory taken in 1649 of Henrietta Maria's Wimbledon: "one very fayre tree, called the Irish arbutis standing in the midle parte of the sayd kitchin garden, very lovely to look upon" By the 18th century Arbutus unedo was well known enough in English gardens for Batty Langley to make the bold and impractical suggestion that it might be used for hedges, though it "will not admit of being clipped as other evergreens are." In the United States, Thomas Jefferson lists the plant in his Monticello gardens in 1778. The form A. unedo f. rubra and the hybrid A. × andrachnoides, have gained the Royal Horticultural Society's Award of Garden Merit. Central panel of The Garden of Earthly Delights by Hieronymus Bosch, which was first described by José de Sigüenza as "The Picture of the Strawberry Tree". The Garden of Earthly Delights, a painting by Hieronymus Bosch, was originally listed by José de Sigüenza, in the inventory of the Spanish Crown as La Pintura del Madroño – "The Painting of the Strawberry Tree". 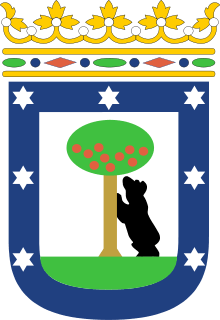 The tree makes up part of the Coat of arms of Madrid (El oso y el madroño, The Bear and the Strawberry Tree) of the city of Madrid, Spain. In the center of the city (Puerta del Sol) there is a statue of a bear eating the fruit of the Madroño tree. The image appears on city crests, taxi cabs, man-hole covers, and other city infrastructure. The fruit of the Madroño tree ferments on the tree if left to ripen, so some of the bears become drunk from eating the fruits. A bear and a madroño (strawberry tree) are the symbol of Madrid. The tree is mentioned by Roman poet Ovid, in Book I: 89–112 "The Golden Age" of his Metamorphoses: "Contented with food that grew without cultivation, they collected mountain strawberries and the fruit of the strawberry tree, wild cherries, blackberries clinging to the tough brambles, and acorns fallen from Jupiter’s spreading oak-tree." In the Italian Risorgimento the strawberry tree, because of its autumnal colours, the same colours of the Italian flag, at the same time red for fruits and white for flowers, beyond the green colour of leaves, was considered, indeed, a symbol of the flag. ↑ Hileman, Lena C.; Vasey, Michael C.; Parker, V. Thomas (2001). "Phylogeny and Biogeography of the Arbutoideae (Ericaceae): Implications for the Madrean-Tethyan Hypothesis". Systematic Botany. 26 (1): 131–143. JSTOR 2666660. 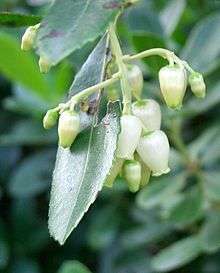 ↑ "Floral markers of strawberry tree (Arbutus unedo L.) honey.". Retrieved 17 March 2014. 1 2 3 Quoted in Alice M. Coats, Garden Shrubs and Their Histories (1964) 1992, s.v. "Arbutus". ↑ Ann Leighton, American Gardens in the Eighteenth Century: 'For Use or Delight' , 1976:395. ↑ "RHS Plant Selector - Arbutus unedo f. rubra". Retrieved 30 May 2013. ↑ "RHS Plant Selector - Arbutus x andrachnoides". Retrieved 30 May 2013. ↑ Warner, Marion. Fantastic metamorphoses, other worlds: ways of telling the self. Oxford University Press, 2002. 70. ↑ "The Metamorphoses, Book I, translated by A. S. Kline © 2000 All Rights Reserved". Poetryintranslation.com. Retrieved 2012-08-27. ↑ Giovanni Pascoli, in the autograph note to his poem "Il corbezzolo" ("The strawberry tree"), compared the virgilian, deposed after death on branches of strawberry tree, to the Italian martyrs wrapped up, during the burial ceremonies, in the Italian flag. ↑ (Italian) various authors - Guida pratica agli alberi e arbusti in Italia; Biblioteca per chi ama la natura - Selezione dal Reader's Digest Milano 1983, 1991. Wikimedia Commons has media related to Arbutus unedo.